Automatic wall dispensers for air freshener. Can be set to run for 24 hours or day time only. Airomist® Aroma fragrances get rid of unpleasant smells and odours. 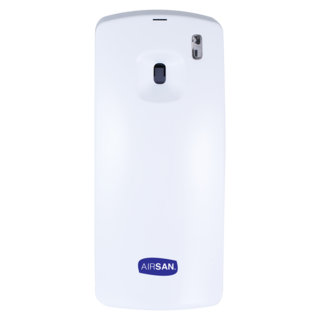 Airomist's in-built odour neutraliser works away to elininate malodors and provides rooms with clean fresh scents. Airomist Aroma is perfect for bathrooms, toilets, kitchens, garbage areas, cupboards, damp rooms, basements, gyms, pet areas, washrooms, locker rooms, hospitals.